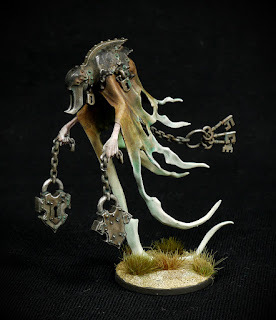 The lure of the new Games Workshop nighthaunt range proved too much for my weak resolve to not buy any new figures. In my defence, these are my first major purchase of the year. I thought they would make a nice addition to my Undead force. 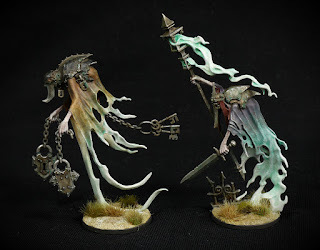 These are a couple of the models from the Soul Wars beginner boxset. I have kept a few of the spirit models and sold on the rest, to keep the cost of my impulse manageable. I managed to carve out a little hobby time over the weekend and rattled through this pair in a couple of sessions. The Warden I imagine to have been a lowly prison keeper in his time. When death came, his spirit wandered, unable to rest after the unspeakable cruelties he had inflicted during his miserable lifetime. The palette had to be something a bit grimey and dark. The green cast of the ghostly vapours echoes the green glow I have used on all my undead figures. In contrast, the Awakener was probably a sorceror or magician in his lifetime, perhaps attached to a royal court or palace. His purple robes reflect a comfortable, opulent existence. 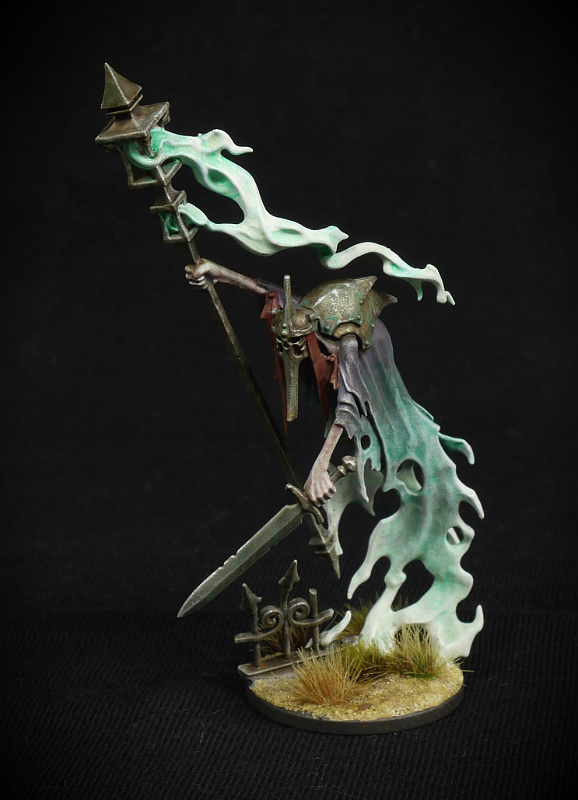 His magical staff is now used to rouse the spirits that the Lord of Bleak Fell requires for his army. A magical servant in life, unable to escape his role even in death. I am really impressed with the figures from the Soul Wars boxset. The fact that they are press together models is quite astounding. I did actually glue mine, as much to disguise the joins as to keep them together. Some are a bit fragile looking, hopefully they will stand up to the rough and tumble of transportation and gaming. As usual with my own collection, they are glued on to two pence coins rather than the supplied bases. 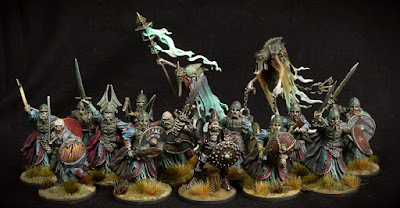 Here's a picture of the Lord of Bleak Fell with his bodyguard and new recruits, heading deeper into the catacombs in search of more spirits. And maybe a few more mundane troops too. Who knows what else they will find in the deep, dark places? ....for the time being at least. 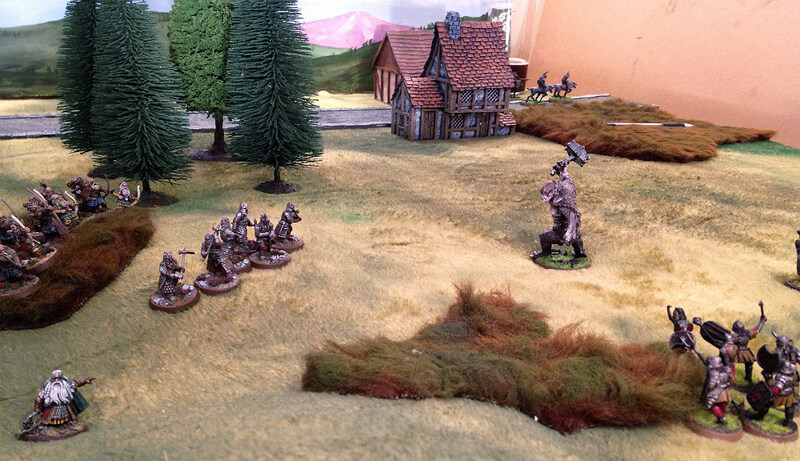 After painting up a fair number of dwarves over the past few weeks, it was nice to get them on to the battlefield. 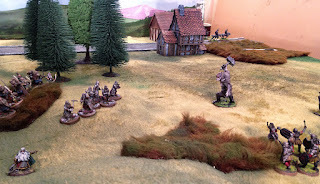 Round at the wargaming dungeon, they faced their hated enemy, the orcs of Sauron. I would have liked to have tried Strategy Battle Game, but we could not remember the rules so settled on the much simpler Dragon Rampant. It's not my favourite ruleset for a number of reasons, but it's always useful to have an easy to play system. 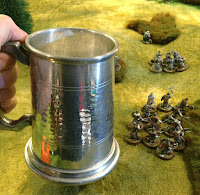 I didn't manage to get too many decent photos, which is just as well because the dwarves suffered from some poor dice rolling, which (to my mind or maybe it's my imagination) always seems far more punishing in this ruleset. One or two failed activations can really swing a game in a drastic fashion. Suffice to say, there was few things to celebrate in the hold that night. This pint was only half drunk! Still, it was good to get the dwarves showing off their freshly painted kilts and stretching their little legs for a change. A couple of days later and I was heading out to a local cafe for a coffee and consolation cake (after England were knocked out of the World Cup the night before). 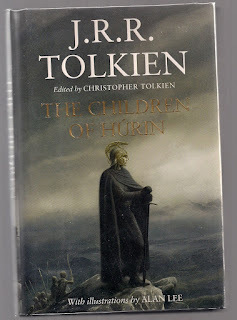 The cafe is positioned above a second hand bookshop and in the main entrance I found a copy of Tolkien's Children of Hurin. A lovely clean hardback copy at a third of the cover price, which was more of a consolation than the cake could provide. Every cloud has a silver lining (this one illustrated by Alan Lee). 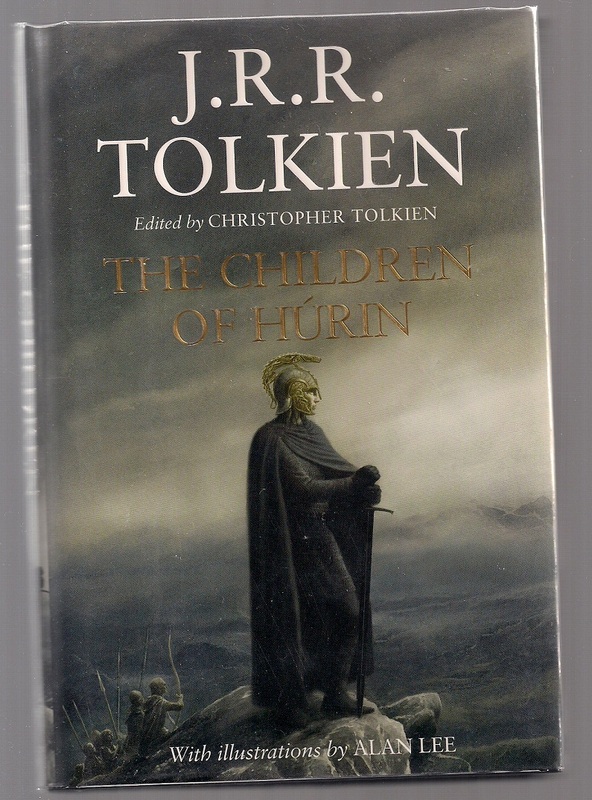 Some reading to look forward to later in the year - I always think Tolkien is best appreciated in the autumn. I reached for my copy of Lord of the Rings the other day, and was surprised to find this set of stamps in there. 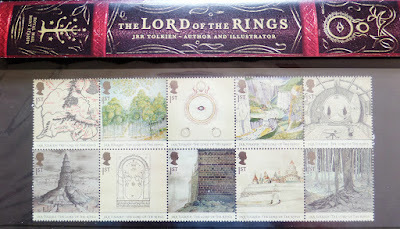 They were published by Royal Mail back in 2004, not sure if that was a Tolkien anniversary or a tie in with the films. They were probably bought by my wife, she used to have a thing about stamps. 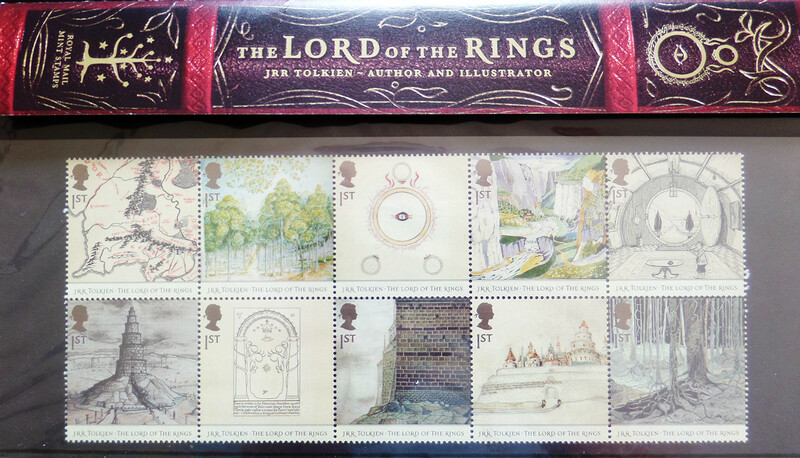 The stamps are held safely in a pouch, which folds out and gives a potted life story of Tolkien. Each stamp contains an illustration by the author. I once read that Tolkien was very insecure about his illustrations. He wanted the books to be published with art, but was not confident in his own efforts. Like many artists, he probably under-estimated his talent. Even the simple line drawings are very evocative. Finally, a key to the illustrations. As a Tolkien nerd, I was very happy to make this chance discovery. The more I see the author's own artistic renditions, the more I marvel at the man's achievements.